Richard Francis Dennis Barry III was born March 28, 1944, in Elizabeth. His father played on local semipro clubs and also coached at the St. Peter and Paul parochial school. Rick and his older brother, Dennis, learned the game from their dad, who always focused on the fundamentals. He was also a talented baseball player. His idol was Willie Mays, whose number 24 he wore in college and the pros. Rick was talented and tall enough to compete against 7th and 8th graders when he was in the 5th grade. He learned a lot playing with Dennis and his friends. The Barrys moved to Roselle in the late 1950s and Rick enrolled at Roselle Park High School. Rick starred for the baseball and basketball teams, earning All-State honors in both sports as a junior and senior. Rick’s only weakness as a basketball player was his free throw shooting; he hit about 70 percent of his shots. On his father’s advice he began shooting underhanded and his percentage climbed into the 90s. Rick received scholarship offers from several top colleges, but chose the University of Miami. The combination of warm weather and coach Bruce Hale—a former NBA All-Star—was the deciding factor. Rick was an elite scorer and rebounder, hitting long jumpers or slicing into the lane for easy buckets. As a senior, he led the nation in scoring with a 37.4 average and was a First-Team All-American. In three varsity seasons with the Hurricanes he averaged 29.8 points and 16.5 rebounds a game. As the NBA Draft approached, some scouts wondered how Rick’s greyhound-like body would stand up to the pounding of the pro schedule. The San Francisco Warriors had no qualms. They took him in the first round and he rewarded them with a brilliant Rookie of the Year season. In his second year, Rick led the NBA in scoring and took the Warriors all the way to the NBA Finals. His 40.8 points per game in a losing cause established a record that stood until Michael Jordan came along. In 1967, the American Basketball Association was formed. Rick was wooed by the Oakland Oaks. He offered the Warriors a chance to retain his services, but owner Franklin Meuli didn’t think he would leave, so called his bluff. Rick wasn’t bluffing. He jumped to the ABA for the 1967–68 season. A court battle ensued and Rick ended up sitting out the season. He kept busy calling the Oaks games on TV and radio. 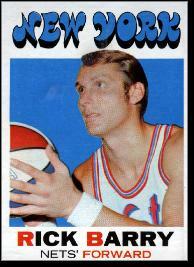 Free to play in 1968–69, Rick led the ABA in scoring and was named MVP. He injured his knee prior to the playoffs, but the Oaks had enough talent to win the championship without him. After the season, the cash-strapped Oaks announced plans to relocate to the Washington DC area. Rick wanted to stay in the Bay Area, so he signed a five-year deal with the Warriors. Now the ABA went to court to keep him from jumping leagues! While the legal issues were unraveled, Rick played a season for the ABA Virginia Squires. He was unhappy in Virginia and the league, fearful of losing its biggest star, engineered a trade to the New York Nets. Rick led the Nets to the ABA Finals in 1971–72, but they lost to the Indiana Pacers. Rick returned to the NBA in 1972–73 after a judge ruled that his deal with the Warriors was legal. The team began building around him and by the 1974–75 season the Warriors were the best club in the Western Conference. That spring, Rick led the club to a four-game sweep of the heavily favored Bullets in the NBA Finals. Rick was named MVP of the series. Trades, injuries and age prevented the Warriors from recapturing their old glory, and in 1978 Rick joined the Houston Rockets as a free agent. With no point guard, the team used Rick as a “point forward.” His scoring numbers plummeted and word circulated that he had lost his scoring touch. After a knee injury no teams were willing to gamble a big salary and roster spot on him—especially after the league cut teams down to 11 players to save money. At 36, he was retired, whether he liked it or not. In 10 NBA seasons, Rick averaged 23.2 points, 6.5 rebounds and 5.1 assists per game, and shot 90 percent from the foul line. No forward during his era could match those all-around stats. Rick was named First-Team All-NBA five times and First-Team, All-ABA four times. In 1986, Rick was inducted into the Basketball Hall of Fame. In his post-basketball life, Rick stayed busy participating in a number of business ventures. He also became a commentator on network broadcasts and hosted a popular sports talk show in San Francisco. He got to watch his sons carve out pro careers, too. The one job he wanted he was unable to get. Everyone who knew Rick said he would make a superior coach. He came close on a few occasions, but his reputation for being brusque and opinionated apparently scared off serious suitors. Given the current lack of all-around skills and basketball IQ in the NBA, it is the sport’s loss that Rick Barry is not working the sidelines for a pro team.